scrawl wrote: I also enabled unity build. I suspect that I'd also have gotten the missing include error with unity build off. Good catch! That was indeed what has been shielding me from these errors. Yet more stuff to fix. Update: My latest push should fix things for non-unity builds. However, I never experienced trouble loading the samplebrowser. Make sure you delete any cache files in your OGRE user directory (~/.ogre on Lin and My Documents/Ogre on Win). Yep, non-unity-build was what I did. I'm now building again a debug version and will (hopefully!) see later where it crashes on my machine. What's weird is that the debug version crashes sooner than the release version. I don't even get the render system selection. Of course, I cleared the Ogre folder before. Also, I just did a rebuild of the current 1.9 version to make sure it still works, and it doesn't. Not sure what's going on here, I'll try to rebuild the dependencies. Okay, did a rebuild using the latest dependencies and the result is the same (same gdb output, too). I wonder what's going on as I can build our own project (which uses a slightly older Ogre 1.9) just fine. And the project runs fine, too. Btw. I do use boost, but also doubt that this has anything to do with my problems. Huh, I was just able to launch the normal 1.9 sample browser when building without boost. I'll now try your branch, also without using boost. Maybe this is the problem, after all (though i have no idea how that could be). Could you try building with boost (I use 1.53) and MinGW to see if this is also a problem for you? Okay... in the current 1.9 branch, I can even build & run the SampleBrowser with the GL3+ RS when not using boost. In your branch, I can not launch the SampleBrowser when using the GL3+ RS and also not normal GL RS when using boost. In fact, it crashes before even the RS selection shows. When not using boost, I can at least launch the normal GL RS, but not the GL3+ one. So without boost, at least the RS selection shows. TheSHEEEP wrote: Could you try building with boost (I use 1.53) and MinGW to see if this is also a problem for you? At the moment I do not have the time as Boost + MinGW always gave me headaches. For now, let's test without Boost to avoid its added complications. I will test Boost + MinGW before beta. Can you give me a stack trace for running GL3+ RS without Boost? Is there a way to ignore bugs in lower level libraries? holocronweaver wrote: Can you give me a stack trace for running GL3+ RS without Boost? TheSHEEEP wrote: Have at thee! Is there an associated error message? Nope, nothing. And the log does not seem to have anything to say about this. TheSHEEEP wrote: Nope, nothing. And the log does not seem to have anything to say about this. are you able to run the sample browser? Guessing it is not that simple, but hope springs eternal. Interesting. Removing that line, I can now run the SampleBrowser. So the problem may be the macro or the GL call itself. I will now try if doing this with boost also works (I doubt it, but we'll see). Nope, it doesn't. Not sure if only my boost is broken or if this is a general problem with boost and MinGW at the moment, or only with boost + MinGW GCC 4.7.2, etc. But I'm too busy with "normal work stuff" atm to dig further here. TheSHEEEP wrote: Interesting. Removing that line, I can now run the SampleBrowser. That is a strange place to crash. Since the crash occurs within the NVIDIA driver, it is a GL call - either from within the macro or the call we see. NVIDIA is usually on top of stuff like this! At any rate, let's test the sample browser without Boost. What samples work? If you are using my latest push, most broken samples should be disabled, except Terrain samples which sporadically work. I remember seeing a commit recently (can't remember which branch) which increased the log buffer size. That call may be crashing because the log buffer isn't large enough. O.o Static buffer sizes and buffer overflow FTW! D'oh! Sorry, should be fixed now. I am still learning all the quirks of Mercurial. cord wrote: I remember seeing a commit recently (can't remember which branch) which increased the log buffer size. Thanks for pointing this out - I will keep it in mind. Given where the crash was occurring, no OGRE buffers should be involved, so I don't think it affects this particular case. 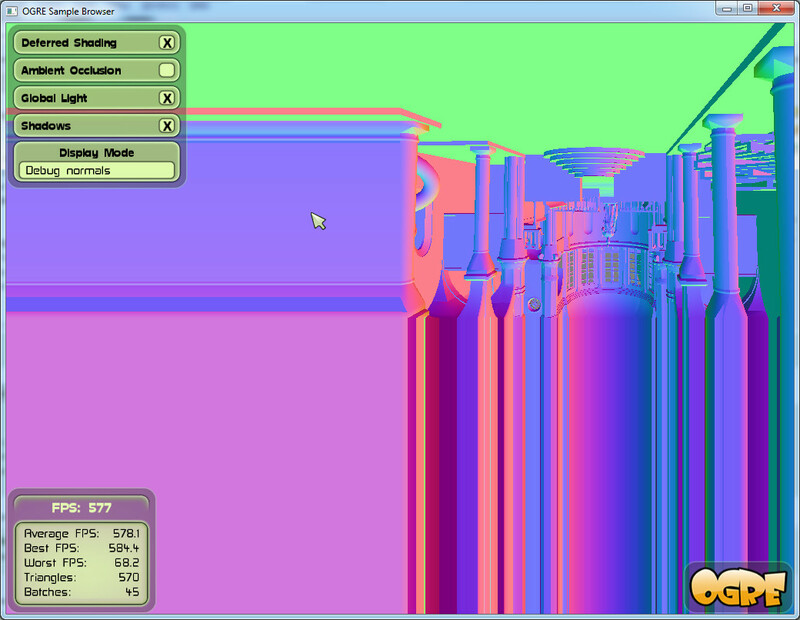 HDR: Shows only black screen, crash OR graphical glitch when trying to select a debug output. See here. Motion Blur: The scene is not blurred, only the mouse pointer is. See here. Heat Vision: Wildly flickering screen. Can't post screenshot as each single frame just has another color. 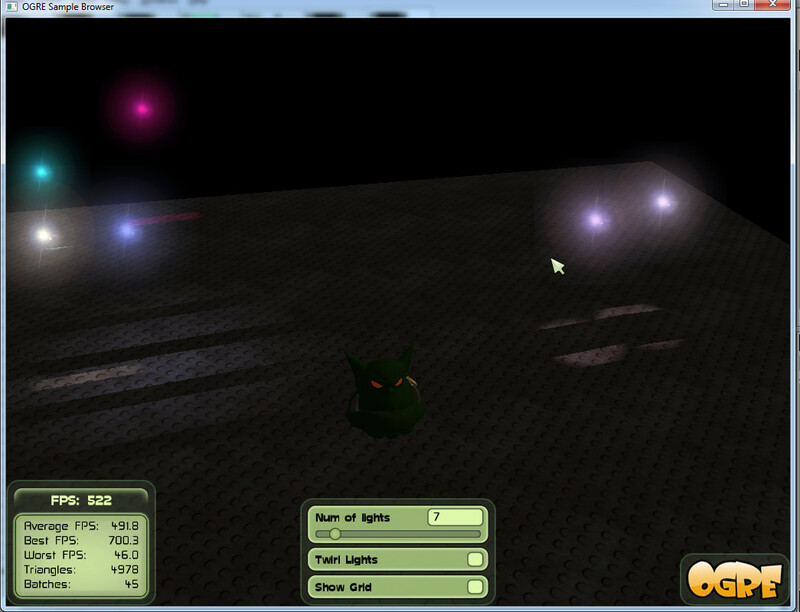 Deferred Shading itself seems working. As well as Global Light and Shadows. 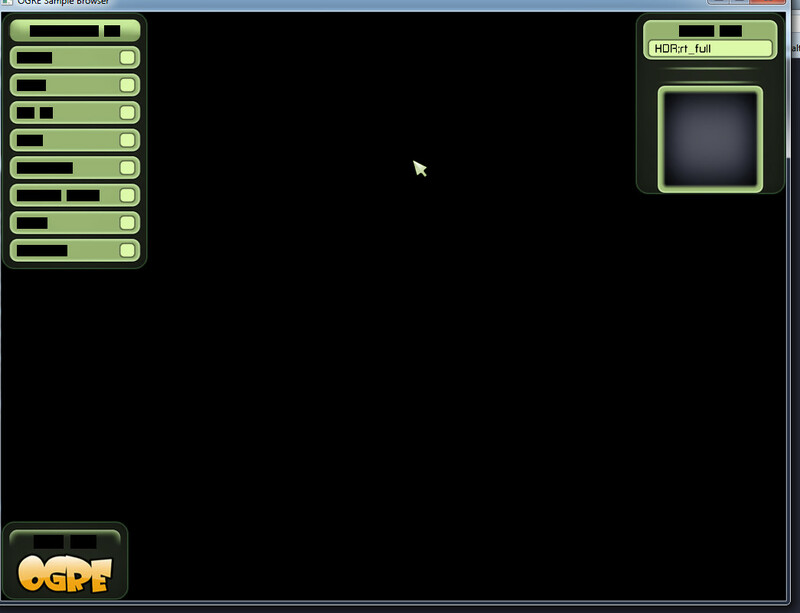 Debug displays look really weird. Endless World - Crash when starting. See log. Facial Animation - Seems to switch each frame between default state and current animation state. Like a model switching between T-Pose and current animation state constantly. New Instancing - Instancing itself working (also with Shader + VTF), but shadows acting strange. See here. Shader System - Crash when starting. See log. Shader System Textured Fog - Sky Box has to be disabled and enabled once before it shows. Sky Box doesn#t show at all when Fog is disabled. Works otherwise. Shader System Multi Light - Weird artifact. See here. Shadows - Not working in any setting. Athena always has lighting applied (but no shadows). The scene itself is always completely black. Terrain - Crash when starting. See log. Tesselation - Not sure what it is supposed to do. I see a triangle consisting of triangles in wireframe and can rotate it. Working, I guess. Volume Terrain - Working, but shouldn't it have a green grass texture instead of mud brown only? Thanks for this list! I will get on top of it ASAP. BTW, like the cursive 'Hello World' for Motion Blur. Yep, that is all it does at the moment. The triangle was originally a single triangle, but is now tessellated into multiple. In December I plan to move this into visual tests and replace the sample with something a bit more interesting. trying to get working minimal example - using basic framework from wiki (that shows only Sinbad's head) - works with GL, but GL 3+ renderer shows nothing but single colour in whole window. clang - Release - crashes with loading GL plugin, but starts after commenting this out in plugins.cfg, crashes regulary at removing PCZScene manager. samples using RTSS are behaving and crashing in rather nondeterminstic fashion. Shadows - no shadows, Athena grey rest black, overlay and cursor corrupted, crashes very often. "OpenGL error 0x0501 GL_INVALID_VALUE in virtual void Ogre::GL3PlusHardwareIndexBuffer::unlockImpl() at line 140 for glFlushMappedBufferRange"
Terrain - crashes leaving corrupted terrain in cache, and the freezes when this is loaded. Note that this problem just got fixed in 1.9 branch (in 7bc686a commit). If correct cached terrain is imported, then sample works. Shadows visible on entities, but not on terrain - enabling them turns terrain irreversibly black. I guess it's good news that the same errors happen on so different systems. ppd wrote: trying to get working minimal example - using basic framework from wiki (that shows only Sinbad's head) - works with GL, but GL 3+ renderer shows nothing but single colour in whole window. To my knowledge, the framework relies on a fixed function pipeline and does not use RTSS to make the appropriate shaders. We really need to make the basic framework rely on neither RTSS nor fix function pipeline. I believe someone already ported the new framework to do this - I will definitely make sure this is taken care of during beta and the wiki is updated accordingly. This is a mix of RTSS shader templates needing to be updated and a few more obscure GL3+ RS / RTSS integration problems I have yet to identify. For the g++ crash you mention, is that Release? Will investigate. I have only tried clang once. Will leave clang support for beta since I don't know much about it and don't have time to fix it at the moment. I would happily accept a documented pull request in the mean time. I am not sure when this started, but only latter-2013 AMD drivers do this. Not sure about NVIDIA. Maybe this is a undocumented AMD bonus feature? I honestly don't mind losing the diagnostic info if the failed state looks this cool. Thanks for pointing these bugs out in particular. Your detailed yet succinct descriptions are great. This weekend I will finish some minor GL3+ RS refactoring, then try to get the remaining samples and visual tests fixed. I have already fixed or identified the issue of 80% of the visual tests. Beta will probably be delayed until next weekend, but the 'official' GL3+ merge will definitely occur before January. holocronweaver wrote: For the g++ crash you mention, is that Release? Will investigate. That's a known issue in the whole source tree right now. It's been fixed and will find it's way into this code soon I'm sure. Yeah, merge with 1.9 or cherry-pick https://bitbucket.org/sinbad/ogre/commi ... 07e8f0c31e , that should fix it. I have pulled upstream changes from v1-9 [s]and will work from there for now on[/s]. Hopefully this will fix problems with clang and a few other things. BTW, the new skybox used in a few of the samples, such as Water, is pretty. Who added that? EDIT: I have merged into default branch since this is where cutting edge ogre dev is occurring. Yay for no more branch hopping! However, keep in mind that the GSoC mesh LOD sample is somewhat unstable at the moment. I have submitted a pull request for GL3+ alpha, which comprises much of my GSoC work and some more recent efforts towards stability. Once finals are over this week I will begin merging in the rest of the summer's GSoC work, flatten out any remaining issues with the visual tests and samples, and then proceed to work on feature completion. After a bit of testing (with your help! ), I will dub the release beta and create a second upstream pull request. The first 'stable' release will happen sometime in January and will include me adding my GSoC samples, tests, and any features I did not get around to during beta. I will try with all my might to make beta release feature complete so that we can have a chance to thoroughly stress test prior to stable release. The samples and visual tests will help, but I will also be counting on users to begin playing with / practically using GL3+ in their own applications to really pick out the weak points. To this end I will be adding an updated basic framework to the OGRE wiki which will allow for building your own applications with the GL3+ RS. The new framework will use a purely shader based approach without using RTSS. No fixed-function pipeline allowed. I just tried your latest repo (default branch) and can no longer start the SampleBrowser. Deleted the cache in ~/.ogre to no avail. OpenGL 3+ Rendering Subsystem (ALPHA) created. DefaultWorkQueue('Root') initialising on thread 0x6469b0. DefaultWorkQueue('Root')::WorkerFunc - thread 0x6ff8e0 starting. DefaultWorkQueue('Root')::WorkerFunc - thread 0xa0eb70 starting. DefaultWorkQueue('Root')::WorkerFunc - thread 0xa0ee70 starting. DefaultWorkQueue('Root')::WorkerFunc - thread 0xa11480 starting. Texture: sdk_cursor.png: Loading 1 faces(PF_A8R8G8B8,32x32x1) with 5 hardware generated mipmaps from Image. Internal format is PF_A8R8G8B8,32x32x1. Texture: sdk_tray.png: Loading 1 faces(PF_A8R8G8B8,64x64x1) with 6 hardware generated mipmaps from Image. Internal format is PF_A8R8G8B8,64x64x1. Texture: sdk_button_up.png: Loading 1 faces(PF_A8R8G8B8,128x32x1) with 7 hardware generated mipmaps from Image. Internal format is PF_A8R8G8B8,128x32x1. Texture: sdk_text_box.png: Loading 1 faces(PF_A8R8G8B8,32x32x1) with 5 hardware generated mipmaps from Image. Internal format is PF_A8R8G8B8,32x32x1. Texture: sdk_mini_tray.png: Loading 1 faces(PF_A8R8G8B8,32x32x1) with 5 hardware generated mipmaps from Image. Internal format is PF_A8R8G8B8,32x32x1. Texture: sdk_track.png: Loading 1 faces(PF_A8R8G8B8,16x32x1) with 5 hardware generated mipmaps from Image. Internal format is PF_A8R8G8B8,16x32x1. Texture: sdk_handle.png: Loading 1 faces(PF_A8R8G8B8,16x16x1) with 4 hardware generated mipmaps from Image. Internal format is PF_A8R8G8B8,16x16x1. Texture: sdk_mini_text_box.png: Loading 1 faces(PF_A8R8G8B8,32x32x1) with 5 hardware generated mipmaps from Image. Internal format is PF_A8R8G8B8,32x32x1. Texture: sdk_label.png: Loading 1 faces(PF_A8R8G8B8,32x32x1) with 5 hardware generated mipmaps from Image. Internal format is PF_A8R8G8B8,32x32x1. Texture: sdk_separator.png: Loading 1 faces(PF_A8R8G8B8,64x16x1) with 6 hardware generated mipmaps from Image. Internal format is PF_A8R8G8B8,64x16x1. Texture: sdk_logo.png: Loading 1 faces(PF_A8R8G8B8,128x64x1) with 7 hardware generated mipmaps from Image. Internal format is PF_A8R8G8B8,128x64x1. Texture: sdk_shade.png: Loading 1 faces(PF_A8R8G8B8,64x48x1) with 6 hardware generated mipmaps from Image. Internal format is PF_A8R8G8B8,64x48x1. Texture: sdk_frame.png: Loading 1 faces(PF_A8R8G8B8,32x32x1) with 5 hardware generated mipmaps from Image. Internal format is PF_A8R8G8B8,32x32x1. Texture: sdk_mini_text_box_over.png: Loading 1 faces(PF_A8R8G8B8,32x32x1) with 5 hardware generated mipmaps from Image. Internal format is PF_A8R8G8B8,32x32x1. Texture: sdk_pulse.png: Loading 1 faces(PF_R8G8B8,8x1x1) with 3 hardware generated mipmaps from Image. Internal format is PF_X8R8G8B8,8x1x1. Texture: sdk_bands.png: Loading 1 faces(PF_A8R8G8B8,2x32x1) with 5 hardware generated mipmaps from Image. Internal format is PF_A8R8G8B8,2x32x1. Texture: SdkTrays/CaptionTexture: Loading 1 faces(PF_BYTE_LA,512x256x1) Internal format is PF_BYTE_LA,512x256x1. I have seen this before on NVIDIA. Is this a fresh clone from ogre-gl3plus-clean? You are crashing in the NVIDIA driver, which is odd because I am experiencing no such crash using driver 331.20. Try commenting out everything from GL3Plus/src/OgreGLSLExtSupport.cpp:39-108 and let me know if it runs fine without the logging. BTW, looks like you are running an old NVIDIA driver version from April. I am curious if upgrading will solve the problem.